The Baker's Nuts: Let's go to the Ex! 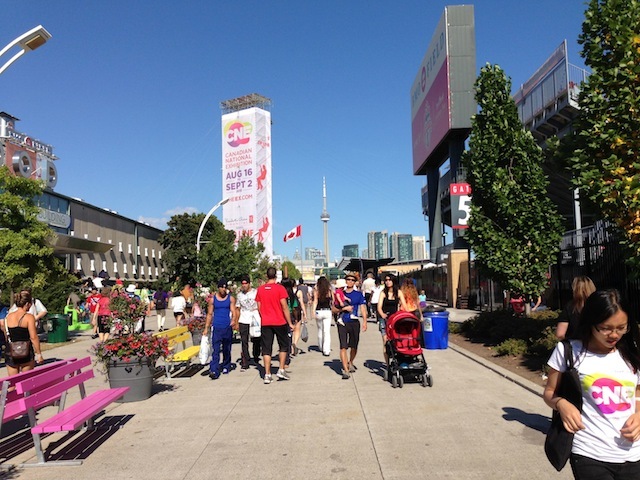 Let's go to the Ex! I didn't end up doing any baking last weekend but I did go to the CNE (Canadian National Exhibition or simply, "The Ex") with my brother. It was an insanely beautiful day and we had a lot of fun watching some shows, walking around and talking, but most importantly eating all the bad food we could fit into our gullets. After all, the Ex is an EXercise in EXcess :). As a kid, we went to the Ex a few times but it was never a "thing" like it was for my parents (or Mom specifically), who mark the end of summer with the advertisements for the Ex popping up on TV. For those who don't know, the Ex is essentially a cross between a giant fair and a giant expo. Every year it runs the last two weeks of August, ending on Labour Day. There are rides, games, shows, art exhibits, tonnes to buy, and lots and lots of food. Fried food :). The first thing you do when you get into the Ex is head to Tiny Tom Donuts. This is non-negotiable. Mini donuts fresh out of the frier, popped into a bag and then topped with icing, chocolate, or apple cinnamon sugar. Any money I spent on parking and passes are completely justified after that first dozen donuts (or three). Unfortunately, no pictures, there simply wasn't enough time :). After a bit of walking around and taking a look at people's wares, we went to watch a fun little dog show that, not surprisingly, made me want a dog even more. I mean the show was definitely for kids, but it was really enjoyable with some clever moments that made us laugh pretty hard. 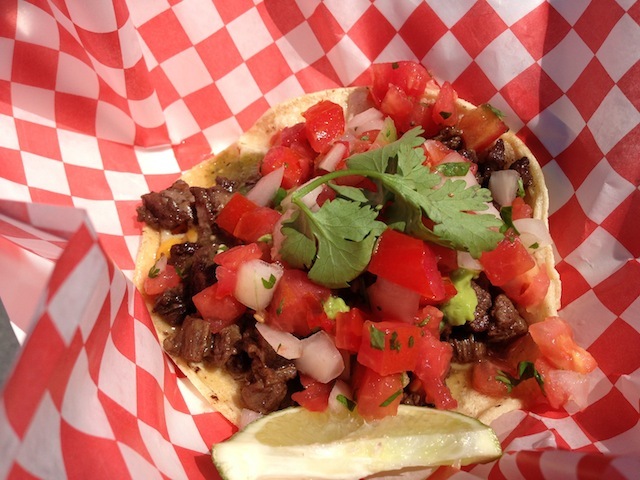 For lunch we hit up food truck alley, which is probably a better name then whatever it was actually called. It was a special event to further promote Toronto's rising food truck scene. My brother and I both felt like Mexican (I can't remember the vendor name). I ordered a Carne asada Tostada and a bottle of water. It cost twelve bucks. The vendors at the Ex are nothing if not experienced at sucking your wallet dry; especially for something that was maybe four inches in diameter. It was alright. Not great. Nothing compared to what we ate in Vegas (for two dollars no less). However, we were both kind of happy that we didn't eat a lot for lunch, it meant we could eat more of everything else, which pretty much started as soon as we downed are tacos. Appropriately, we followed them up with some churros filled with chocolate, caramel, and strawberry sauce, eating them while watching high wire walkers do their thing. More walking, more talking, no rides or games though. Took a look at some art, didn't buy anything. I always mean to, but can never find something I want. I did come dangerously close to buying my brother's dog a pink embroidered robe though. Oh, and we also got to see a live cooking demonstration by Susur Lee, which was awesome. I've know of him for a long time, and really want to try and get to one of his restaurants. On our way to watch a small Cirque du Soleil-esque show we stopped for some corn dogs. 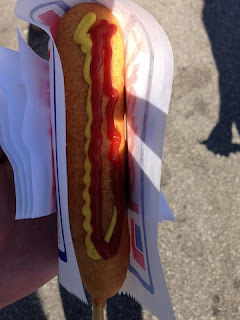 For me fresh corn dogs are one of those quintessential fair foods. I don't normally eat hot dogs but it's one of those things I can only get at the Ex, so I do. It was another good show, but a little incomprehensible at times (poor audio work). It was made twice as good when some Lindsey Stirling came over the loud speakers. I understand if you are unaware of my Lindsey Stirling obsession, let me tell you, it runs deep. 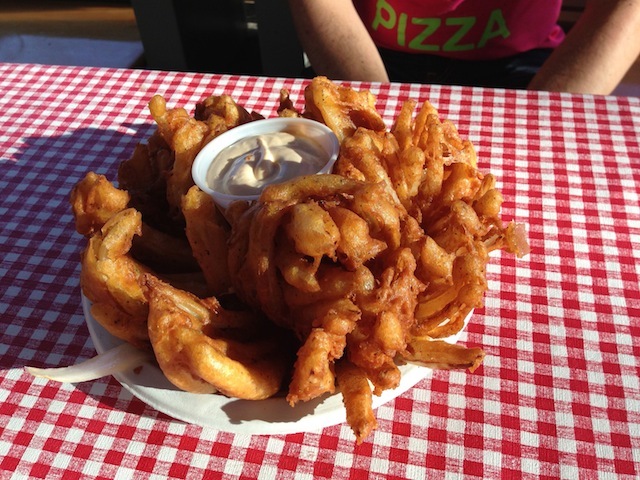 Afterwards, we figured we needed to add some veggies to our diet for the day, and went to get a bloomin' onion. 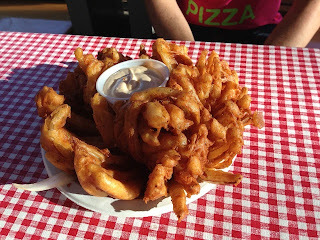 To be fair, we had originally ordered the slightly less insane plate of onion rings, but it seemed they had an extra bloomin' onion, and I was tired of waiting. Besides, it looked really good and was. Although there really is only so much fried onion you can eat, but with a little bit of shame, we did manage to finish it :). Randomly at the Finnish booth, I was intrigued by some liquorice and decided to give it a try. 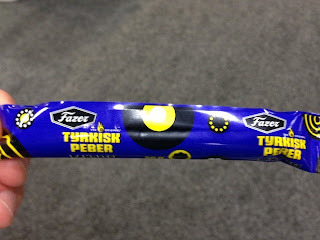 It promised to have a little bit of spice and was definitely the most interesting thing we tried all day. It was essentially a mild black liquorice, with a creamy almost coconut-y centre and a slight hint of salt that when you finished chewing kicked you in the teeth with some peppercorn hotness. It was pretty good. I'd definitely eat it again :). Normally the only way to cap off a day at the Ex is with some funnel cake. However, my brother made it known that he has never had a Beaver Tail. I'm not entirely sure, but that might be grounds enough to repeal his citizenship, or at least revoke his passport. This needed to be remedied, so we ended the night with Beaver Tails; mine topped with apple cinnamon, his with an Oreo topping. It was terrific. I mean, fried dough right? :). It was a great day and hopefully we can do it again next year; we did miss the fried Oreos. Oh and one thing about going to the Ex that I wish the media understood: we know the food is bad for us. You don't need to try and scare us every summer. We don't care how many calories are in the fried Snickers bar, or how much fat is in the donut burger. It's one day. Stop trying to ruin everything. 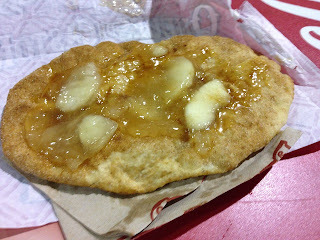 I'd never heard of a Beaver Tail! I learn something every day! It is hilarious that they advertise the Beaver Tail as being made of whole wheat dough--your selection looks relatively modest compared with the Beaver Tails encrusted with chocolate and Reece's Pieces. Fair food is very regional--there is no mega-state fair in my area on the level of the 'Ex' but typical staples include funnel cake, zeppole, and cotton candy. Maybe some hot dogs and cups of crinkly fries. Even as a kid, that stuff was too sweet for me--now some fairs have branched out and offer the ubiquitous fried Oreos and Snickers and such as well.